A series of fish death events occurred in the lower Darling river, near Menindee in New South Wales over the summer, populations of the native species Murray Cod, Silver Perch, Golden Perch and Bony Herring were smashed. 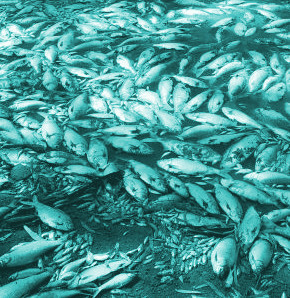 Experts estimated the total number of fish deaths to be in the range of hundreds of thousands to more than a million fish. A new report for the Federal Government has examined the causes of these events and recommended actions to avoid repeat events in the future. The study found that high-flow events in the Darling River in 2012 and 2016 filled the Menindee Lakes and led to substantial fish breeding, aided by the addition of environmental water. This meant there were very large numbers of fish in the lakes and weir pools around Menindee. After rains in late 2016, two very dry years ensued, the supply of water dried up, and the river became a series of dwindling, unconnected pools, leaving the large population of fish around Menindee isolated within weir pools. Hot weather, low rainfall and low flows then led to algal blooms and thermal stratification in the weir pools, leaving oxygen levels low within the bottom waters. With fish stressed by high temperatures, massive numbers lost access to sufficient oxygen and died. The experts say the mass fish deaths in the lower Darling were preceded and affected by exceptional climatic conditions, with inflows to the water storages in the northern Basin over 2017-18 at the second lowest for any two-year period on record. “Climate change amplified these conditions and will likely result in more severe droughts in the future,” the experts say. By way of recommendations, researchers say drought resilience in the lower Darling can be enhanced by reconfiguring the Lake Menindee Water Savings Project, changing the Menindee Lakes operating rules and purchasing high-security water entitlements from local farms. They also called for the removal of barriers to fish movement and the creation of fish passageways. More details on the findings and recommendations are available here.